Some of these online transactions are cross-border related, with many companies, especially small and medium-sized enterprises (SMEs), seizing the opportunities offered to enhance their participation in global value chains, and increase their market access and outreach in order to develop their exports. An eBay report on SMEs based in member countries of the Asia-Pacific Economic Cooperation forum, for example, showed that the average commercial seller on eBay exported to 36 countries. In a declaration on e-commerce adopted by the WCO Council in June 2001, Members of the Organization recognized the potential impact of e-commerce on the economic and social wellbeing of nations, as well as the need for Customs to develop an appropriate response to reconciling facilitation and control in order to meet traders’ needs. The topic was also high on the agenda of the 2015 WCO Council and Policy Commission sessions, and will continue to be further discussed in the coming months. Customs, transport and logistics services are critical elements in the global supply chain, and as such, the effectiveness and efficiency of a Customs administration has a significant impact on the extent to which a country can benefit from the increase in cross-border trade caused by the growth in e-commerce. The overall challenge for Customs is to be able to operate in a modern e-enabled environment and, in doing so, to operate more effectively and efficiently. In particular, Customs needs to make available a range of electronic services which allow e-enabled traders to deal with Customs authorities entirely electronically, using simple, easily accessible services. This article examines some key measures that Customs administrations may like to take to support cross-border e-commerce, as well as to address the challenges and opportunities that e-commerce represent. Besides the traditional global players, the Internet provides those market participants who were formerly conducting their business on a local or regional level with easy access to global markets. New applications, platforms and services are making e-commerce more accessible and easier to navigate, thereby lowering the entry barriers into this type of business model. Among these are mobile apps and remotely delivered services – for example, microwork which enables e-commerce sites to manage small tasks, such as translating text, tagging an image and modifying content. The tasks involved in the global supply chain in physically delivering goods across borders remain the same, namely order, ship and pay. However, e-commerce has been changing the trading landscape by creating a system which requires very few, and sometime new, intermediaries in the supply chain. Under the traditional ‘brick and mortar’ trading system, goods are imported in bulk by an intermediary, as part of a single operation, and any increase will not produce particular control difficulties. With cross-border e-commerce however, private/individual purchasers order goods for their own use via computer networks directly, thereby bypassing intermediaries – a phenomenon which leads to the fragmentation of traffic with large number of small shipments, and places additional pressures on Customs resources. In the e-commerce environment, when the supply chain and its various actors are e-enabled, there is a growing need for moving towards e-Customs, which would support and facilitate the clearance of ever increasing shipments, thereby ensuring effective control and efficient collection of revenue. The WCO Revised Kyoto Convention – ICT Guidelines, provide details on how Customs can use information and communication technologies to enhance program delivery and move towards a more electronic environment. The Moreover, the WCO recently developed the ‘IT Guidance for Executives’ and is currently engaged in mapping its IT related tools and instruments to provide further support to ‘Digital Customs’. 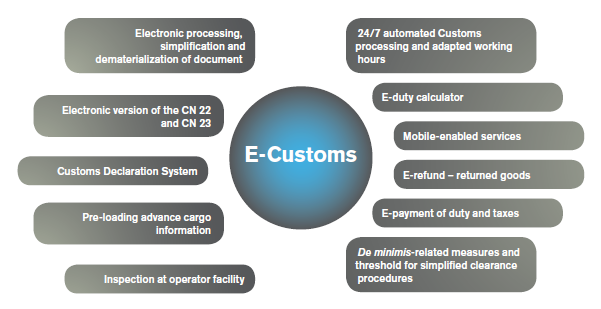 Since the beginning of the 21st century, Customs services have undergone rapid transition, with traditional paper-based procedures being eliminated in favour of electronic forms of delivery, which are also capable of incorporating security elements and trade facilitation measures for trustworthy economic operators. Moreover, WCO Members are encouraged to identify supporting documents that are normally required to accompany cargo and goods declarations, and to examine their necessity with a view to eliminating them, at the same time creating a single window environment for ‘one filing, one processing and one release’. E-commerce has no time and space limitations. Orders for goods can be placed, accepted and delivered, cutting across various time zones. As a result, there is a potential need for Customs to allow 24/7 clearance facilities. This may require automated processing with a robust risk management system, along with the redeployment of staff at border points. Some WCO Members have already introduced this facility for specified categories of shipments at designated places of entry and exit. In order to make a 24/7 clearance facility effectively operational, the commitment and active involvement of other government agencies and stakeholders is essential. E-payment is advantageous to both tax-payers and governments. For taxpayers, it affords them the facility of making payments from anywhere on a 24/7 basis, and for governments, it ensures immediate collection of taxes and discrepancy-free efficient reconciliation. Besides expediting the process of paying duties and taxes and clearing imported goods, the e-payment facility also results in reduced transaction costs for traders and Customs, while supporting e-commerce. Many Customs administrations have taken initiatives in this regard, even to the extent of making e-payment mandatory in certain situations. Article 7.2 of the WTO Trade Facilitation Agreement (TFA) also provides that “each member shall, to the extent practicable, adopt or maintain procedures allowing the option of electronic payment for duties, taxes, fees and charges collected by Customs incurred upon importation and exportation.” The WCO has developed tools, such as the ICT Guidelines and the Single Window Compendium, to help its Members establish automation systems for electronic payment methods. A web-based interactive duty calculator provides sellers and buyers with full information on duty and tax rates in a transparent and easily accessible manner. This helps sellers and buyers to know, in advance, the leviable duties and taxes while negotiating their orders, and to make provision for such payments. Such a facility may also provide information about prohibitions, restrictions and licensing requirements, so that sellers and buyers are fully aware of all requirements when placing orders. In line with the ‘any time anywhere’ concept of e-commerce, Customs has also started providing several mobile-enabled services, such as notifying clients of the status of their declaration, as well as providing Customs exchange rates and duties payable. Some systems even enable requests to be filed and notify clients directly on the processing status of their requests, as well as the time needed to deliver the requested services. In addition, several Customs services have introduced mobile-enabled duty payment services (MPay), providing significant time and cost savings. In the e-commerce environment, a customer should be confident that they will be able to return ordered goods if they do not meet their needs and requirements or fall short of their specifications, including quality requirements. Growing volumes in small packets and parcels calls for consideration of streamlined functions like simplified and efficient returns in bona fide cases, and duty cancellation/refunds on such items to reduce administrative burdens and costs. Customs could explore the possibility of inspection and of release goods at the operator’s facility or require their transfer to another facility, and also coordinate joint inspections with other agencies, if required, in order to avoid delays in releasing shipments. To further strengthen the security of the air cargo supply chain, Customs is moving from ‘pre-arrival’ to ‘pre-loading’ advance cargo information (PLACI). 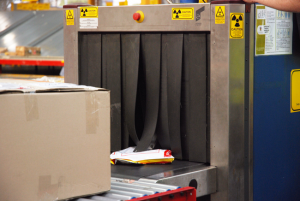 Some ongoing PLACI pilots for security risk analysis are also engaging postal operators. In this context, standards for submission of PLACI by various entities in the air cargo supply chain, including postal operators, have been included in the updated WCO SAFE Framework of Standards, which was endorsed by the WCO Council in June 2015. The WCO and the Universal Postal Union (UPU) have collaborated to jointly develop electronic messages which enable Posts to exchange data contained in CN 22 and CN 23 forms, the Customs declarations for international mail, via EDI. The UPU’s Postal Technology Centre has developed an electronic Customs Declaration System (CDS) on the basis of the Joint WCO/UPU Customs-Post EDI message. Two sets of electronic messages are involved in the CDS process. The first message replaces the paperwork normally used for Customs declarations. A second message, sent in response by Customs, contains information about whether or not an item should be presented to Customs. This message may also contain additional data, including the value of any duties or taxes the sender may need to pay. The presence of this data could vary depending on the specific agreement between a national postal service and Customs authority. The WCO has made express provision for de minimis regimes in its Revised Kyoto Convention (RKC) which focuses on the simplification and harmonization of Customs procedures. Among other things, the RKC states that “National legislation shall specify a minimum value and/or a minimum amount of duties and taxes below which no duties and taxes will be collected” (see RKC Transitional Standard 4.13). In the context of Customs clearance, the de minimis threshold is used in two ways: firstly, as a ‘value’ threshold below which duties and taxes are not collected and no Customs declaration is required; and secondly, as a ‘reporting’ threshold for goods in respect of which a full Customs declaration must be submitted. In other words many Customs administrations adopt two levels of de minimis. Goods whose value falls between the two thresholds are usually the subject of a simplified Customs declaration. 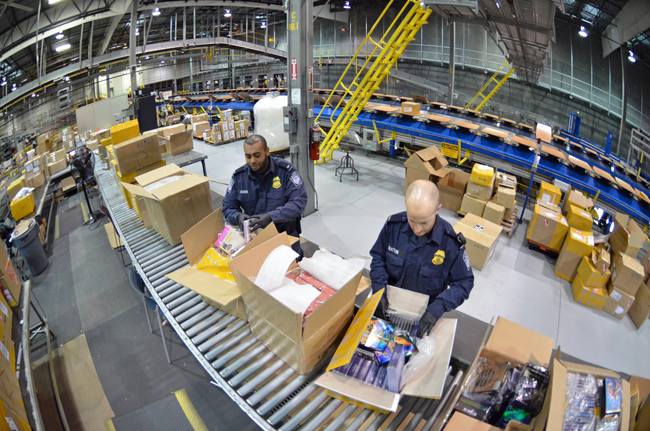 The WCO Immediate Release Guidelines support e-commerce by providing guidance to both Customs and trade, expediting the clearance of goods across borders that are primarily being carried by express cargo and/or express mail service providers. The Guidelines also provide for simplified clearance procedure for consignments for which no duties and taxes are to be collected or low dutiable consignments. E-commerce may been seen as an opportunity. An opportunity for Customs to constantly reassess and accordingly realign and adapt their processes with simple, consistent, transparent, non-discriminatory and enforceable trade rules and procedures, providing more reliable, predictable and speedy clearance, while ensuring compliance with various regulatory requirements. The Internet of Things (IoT) provides a great opportunity for Customs in terms of access to more information, enabling goods to be controlled and regulations to be enforced. E-commerce is indeed a data-rich environment that demands equally strong data capabilities. Customs would need to create an operating model that captures big data from across the industry ecosystem. Customs could also endeavour to move beyond the electronic processing of declarations, collections of duties and taxes, and risk-based controls, to embrace a more digital environment – one that uses technology and trends to help increase efficiencies. Predictive analytics capabilities and Customs-to-Customs international cooperation networks, together with partnerships with private stakeholders, may enable Customs to move from controls on non-compliance to, possibly, the timely prevention of illicit trade whilst providing enhanced facilitation to legitimate trade. Besides a sound legal framework, some of the key challenges relate to mutual agreements between various actors in the supply chain to accept and transmit documents/information electronically, data quality, and a robust information and technology (IT) infrastructure, including its inter-operability and data privacy and protection. Between Customs and e-commerce intermediaries (marketplaces, transporters/carriers, freight forwarders, express operators, postal operators and financial intermediaries). There are already some developments where relevant Customs information are no longer being held by companies within the jurisdiction of a particular Customs administration. The Internet enables businesses to establish a seamless and borderless commercial system, resulting in Customs and other relevant regulatory information being centrally stored in one global location. In the context of advanced cooperation with the trade, Customs should be able to have improved access to commercial information directly or indirectly related to an international trade transaction, for risk management and Customs control purposes. Cooperation between Customs and postal/express cargo service providers is of particular importance. For instance, besides seamless exchange of information, postal/express service staffare usually well placed to bring suspicious postal articles to the attention of Customs. Engagement/partnership with vendors/e-tailers focused on enhanced facilitation in lieu of compliance. As part of the selling and delivery process, vendors collect key data sets, including details of the product that is being sold to the purchaser; the price paid for the goods; the place of delivery, the person to whom the goods are being consigned, the price paid for the transport, the payment details, the delivery mode and tracking data (including tracking number and carrier/postal operator), and possibly the amount of taxes due on importation and associated administrative costs when the price made to the purchaser includes these costs. The nature of the purchaser (business or final consumer) may also be known, depending on the contractual arrangements and circumstances. Close cooperation and engagement with vendors and e-tailers could be quite beneficial to Customs in getting the most reliable data, however, such a partnership will need reciprocal arrangements in terms of Customs providing enhanced facilitation, as well as suitable data privacy safeguards. Data quality – the accuracy and completeness of data – is another key issue for risk management, security controls, admissibility checks and other decisions to be taken by border control authorities. Many clients sending international items are occasional shippers, and are often not fully conversant with the requirements of data quality. Missing, illegible, incomplete or otherwise incorrect information in a declaration may affect the risk analysis, and the efficient processing, clearance and release of goods by Customs leading to delays and additional costs. Different levels of development in terms of IT infrastructure and Internet usage will require an increased effort from all parties, and will, in particular, call for more effective coordination among donor countries and institutions to bridge the so-called digital divide.